warning: call_user_func_array() expects parameter 1 to be a valid callback, function 'swfupload_upload_access' not found or invalid function name in /var/www/clients/client210/web399/web/includes/menu.inc on line 452.
strict warning: Non-static method view::load() should not be called statically in /var/www/clients/client210/web399/web/sites/all/modules/views/views.module on line 879.
strict warning: Declaration of calendar_plugin_display_page::options_submit() should be compatible with views_plugin_display_page::options_submit(&$form, &$form_state) in /var/www/clients/client210/web399/web/sites/nueva.cofradiadesenclavo.info/modules/calendar/includes/calendar_plugin_display_page.inc on line 0.
strict warning: Declaration of calendar_plugin_display_page::options() should be compatible with views_object::options() in /var/www/clients/client210/web399/web/sites/nueva.cofradiadesenclavo.info/modules/calendar/includes/calendar_plugin_display_page.inc on line 0.
strict warning: Declaration of calendar_plugin_display_block::options() should be compatible with views_object::options() in /var/www/clients/client210/web399/web/sites/nueva.cofradiadesenclavo.info/modules/calendar/includes/calendar_plugin_display_block.inc on line 0.
strict warning: Declaration of calendar_plugin_display_attachment::options_submit() should be compatible with views_plugin_display_attachment::options_submit(&$form, &$form_state) in /var/www/clients/client210/web399/web/sites/nueva.cofradiadesenclavo.info/modules/calendar/includes/calendar_plugin_display_attachment.inc on line 0.
strict warning: Declaration of calendar_plugin_display_attachment::options() should be compatible with views_object::options() in /var/www/clients/client210/web399/web/sites/nueva.cofradiadesenclavo.info/modules/calendar/includes/calendar_plugin_display_attachment.inc on line 0.
strict warning: Declaration of date_handler_field_multiple::pre_render() should be compatible with content_handler_field_multiple::pre_render($values) in /var/www/clients/client210/web399/web/sites/nueva.cofradiadesenclavo.info/modules/date/date/date_handler_field_multiple.inc on line 0.
strict warning: Declaration of views_handler_argument::init() should be compatible with views_handler::init(&$view, $options) in /var/www/clients/client210/web399/web/sites/all/modules/views/handlers/views_handler_argument.inc on line 0.
strict warning: Declaration of date_api_argument_handler::init() should be compatible with views_handler_argument::init(&$view, &$options) in /var/www/clients/client210/web399/web/sites/nueva.cofradiadesenclavo.info/modules/date/includes/date_api_argument_handler.inc on line 0.
strict warning: Declaration of views_handler_filter::options_validate() should be compatible with views_handler::options_validate($form, &$form_state) in /var/www/clients/client210/web399/web/sites/all/modules/views/handlers/views_handler_filter.inc on line 0.
strict warning: Declaration of views_handler_filter::options_submit() should be compatible with views_handler::options_submit($form, &$form_state) in /var/www/clients/client210/web399/web/sites/all/modules/views/handlers/views_handler_filter.inc on line 0.
strict warning: Declaration of views_handler_filter_boolean_operator::value_validate() should be compatible with views_handler_filter::value_validate($form, &$form_state) in /var/www/clients/client210/web399/web/sites/all/modules/views/handlers/views_handler_filter_boolean_operator.inc on line 0.
strict warning: Declaration of calendar_view_plugin_style::options() should be compatible with views_object::options() in /var/www/clients/client210/web399/web/sites/nueva.cofradiadesenclavo.info/modules/calendar/includes/calendar_view_plugin_style.inc on line 0. Organizada por la Orden Franciscana Seglar y esta Cofradía. La procesión del Santo Entierro sale de la Capilla de la Soledad, junto a iglesia gótica del antiguo convento de San Francisco, en el claustro del cual se representaban ya antes del siglo XVII las escenas principales de la Pasión. 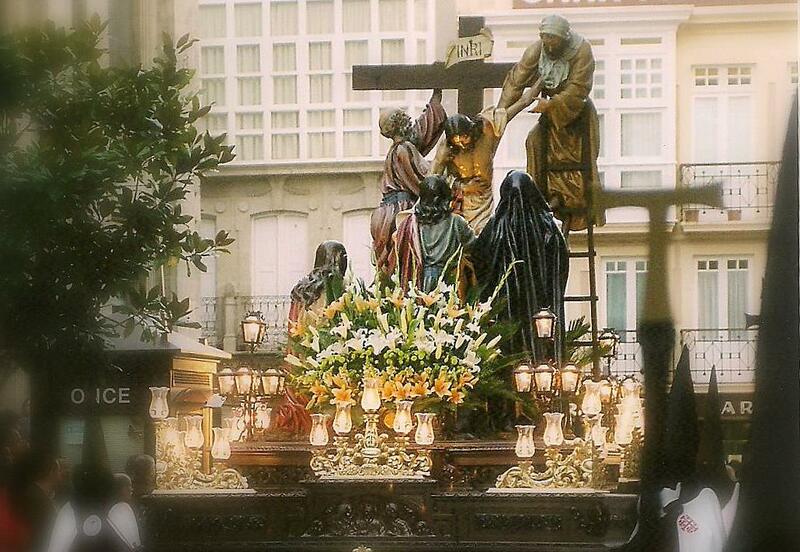 Es el acto central de la Semana Santa. La imagen de Cristo Yacente, que procede del antiguo Convento de Santo Domingo y hoy pertenece a la Orden Franciscana Seglar, es atribuida al escultor del siglo XVIII Agustín de Baamonde. La imagen de la Virgen de la Soledad, o del Séptimo Dolor, que acompaña a su Hijo en la procesión, es obra del notable imaginero y orfebre compostelano Manuel de Prado Marino, que floreció en el último tercio del siglo XVIII. Se incorpora a esta procesión desde el año 1948 el majestuoso Paso del Desenclavo del Señor, realizado en el taller compostelano “Rodríguez y Puente”, y desde el año 2001 se integra la imagen del Cristo del Desenclavo, hecho en 1955 por el mismo taller, que unas horas antes es descendida de la Cruz por los cofrades en el Acto del Desenclavo, y portada por miembros de la Policía Autonómica de Galicia, Hermanos Mayores Honorarios de esta decana Cofradía. Las demás hermandades se incorporan a esta procesión a su paso por la plaza de Santa María. Introduzca su email y le haremos llegar las noticias.